Ske -phb:-our fiber glass body portable glass hand edging , beveling and designing machines are available with rough , medium and fine diamond wheeld to make staind glass tukdi works, design works, straight , squere, triangle, round , half round etc. With enriched industrial knowledge, we have been able to offer a wide spectrum of Glass Straight Line Beveling Machine. Starting Price: Rs 1200000 To 1500000. While keeping pace with advance technology, we are providing Beveling Grinder that is developed at par with high industrial standards that ensure its high quality and affordable price. - Feeding Speed: 0.3-3 m/min. Our beveling set up is the largest in India.This ensures that the beveling has perfect corners meeting at right angles so that the beveled line is absolutely straight and there is excellent clarity. 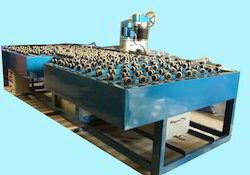 Keeping in mind the ever-evolving needs of our clients, we are devoted towards offering an optimum quality array of Horizontal Glass Beveling Machine.